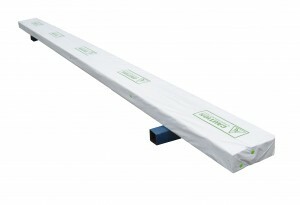 The woven beam wrap offered at Flexpak is high quality wrap for packaging both beams and joists. The quality and reliability of engineered wood products and beams require maximum protection from the elements in the shipping process; Flexpak’s woven beam wrap provides a cost-effective solution to protective packaging. The woven beam wrap at Flexpak is produced with an 8 x 8 weave of High Density Polyethylene and coated on both sides with a Low Density Polyethylene, which provides a durable packaging solution for beams and joists. 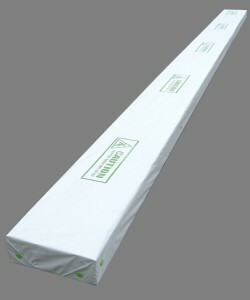 Printed or plain, woven beam wrap is usually produced with a white coating on one side and a tan coating on the other. See the lumber wrap page for explanations on color differentiation for woven wrap products in the sawn wood and lumber industry. The woven beam wrap is not limited to white/tan coating. A white/white or white/black woven beam wrap is another option, providing adequate opaque for a cool package and resisting UV sun damage, while maintaining water-resistant properties. The white/white coated woven beam wrap can also utilize a solid opaque scrim in the weave, which holds the properties found in darker coatings on the inside, but limits color wear-off on external wood products. Printed woven beam wrap is also an option. A four-color print is available for all woven wraps and woven covers. The sales department at Flexpak works with customers to develop a printed woven beam wrap that utilizes the limited space on narrowly defined products to optimize the desired outcome of a printed wrap. Print and woven wrap quality combine to represent the quality of beam or joist being packaged. If there are issues with fastening beam wrap, see the fastening page or contact Flexpak with questions. Please feel free to contact Flexpak at any point to discuss woven beam wrap or ask questions regarding the packaging process for beams and joists.